Yes, there IS a Connnection Between Vitamin D and Children's Teeth! Some but not all of my children had/have badly decayed front teeth already in their first year even though they were not drinking from bottles. I was wondering if a deficiency in vitamin D can be the cause. 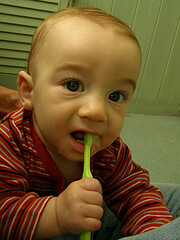 Comments for Infant Cavities: Is there a Vitamin D link? Yes, there is definitely a link between cavities and baby teeth, I have outlined at least 3 to 4 studies on this exact subject (with links) on my Vitamin D and Teeth page. But another aspect of cavities that you should note, is the connection between cavities in children and processed foods as outlined by Weston A. Price in his EXTENSIVE studies of isolated people who had no access to processed foods in his book Nutrition and Physical Degeneration. While this book is VERY LONG, I urge you to take the time to read through at least a couple of chapters so that you can see the price that you pay for giving your children ANY amount of processed foods. This book basically shows that cavities are a symptom of poor nutrition in children! And if you were breast feeding and feeding your children perfectly otherwise, and they still got cavities, then what were YOU eating and how much vitamin D were YOU getting that they were ABLE to get cavities! While saying that a parent who is eating processed foods is directly responsible for the cavities in her young children (as well as the impacted wisdom teeth that we consider an inevitable part of human life), this is the only response that will get this to change. While we would consider it CRIMINAL to see a pregnant woman drinking alcohol or smoking, we think NOTHING of that same woman drinking a pepsi or eating processed breakfast cereal or eating a white flour muffin. But these things are likely to be EQUALLY as bad!! So, what I am saying is that cavities in children are a symptom of poor nutrition!! Mothers, I hope that you are taking notice because cavities are NOT accidents, they are due to nutrition and only YOU can change this Unnecessary Epidemic of cavities in children. Cavities are NOT normal! !